From conception to completion, our singular aim is to exceed all expectations through the installation and maintenance of a residential sprinkler system, custom-built to the specifics of your lawn, garden or property. This also includes sprinkler repair & maintenance as well as spring start-up and winterization packages. 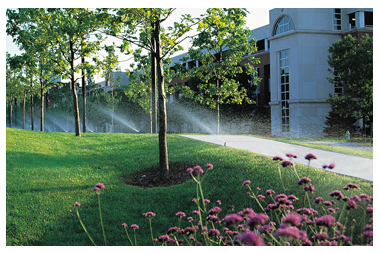 We provide solutions for businesses looking to create or maintain a lush and healthy landscape. This includes schools, office buildings, sports fields, shopping centers, condos and more. Our team has served some of Ontario's most elite golf courses, assisting them in maintaining their breathtaking landscapes. The Future Green Irrigation team has a combined total of three decades providing irrigation for many of Ontario's most elite golf courses, from small renovations to complete renovations. We carefully examine the unique shapes and features of your landscape, and work closely with you to determine your goals and visions for the course. We offer trenching, vibratory plow & excavating services to contractors who need the job done right the first time on time, by experienced operators with the right equipment. 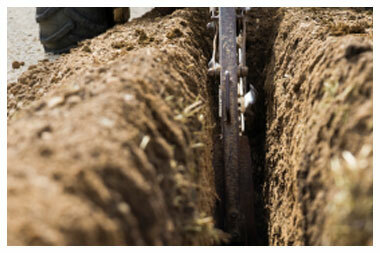 We do light trenching for contractors working with utilities, gas piping, electrical, cabling, pools, spas and more. With over 30 years combined experience in the commercial and residential irrigation and lawn sprinklers industry, it's our mission to provide our customers with a service that exceeds all expectations - whether installing a new sprinkler system or maintaining an existing system. With Future Green Irrigation, no project is too large or too small and you deal directly with the principals of our business, which provides you with a commitment to quality through a personalized, hands-on approach, and peace-of-mind through accountability and trust. Explore our site to find out more or contact us today for a free quote by calling (416) 553-7488 in Toronto, Newmarket/Bradford: 905-960-0040, (705) 999-0907 in Barrie or Toll Free (866) 936-5296. You'll be glad you did! Irrigation & Lawn Sprinkler Systems for Barrie, Simcoe County, Toronto, the GTA and beyond including Bradford, Aurora, Bolton, Caledon, Innisfil, Wasaga Beach, Collingwood and Newmarket.